On Tuesday 14 June, the leaders of the largest homelessness service providers gathered in Sydney to discuss how to make reducing homelessness a national priority in the Federal Election. The charities, Anglicare Australia, Mission Australia, Salvation Army, St Vincent de Paul Society, UnitingCare Australia and Wesley Mission have written a joint letter to all party leaders urging a commitment to halving homelessness by 2025. They know that homelessness and housing are priority issues for voters, and used the opportunity to discuss how to increase pressure on the major political parties to respond. At the first of a number of forums across the country, the charity bosses introduced people who have used their services to Shadow Housing and Homelessness Minister, Senator Katy Gallagher, to explore their personal experiences of homelessness. The group is also due to meet with Minister for Social Services Christian Porter and Senator Rachel Siewert, Greens spokesperson for Community and Disability Services. In a joint statement, they said: “On any given night over 100,000 Australians are homeless – including over 44, 000 children or young people. 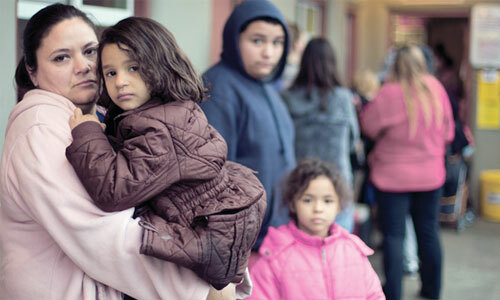 And each year more than 200,000 people seek help from homelessness services. “The numbers are growing and we need Federal Government leadership to reverse that trend. We are urging each party to commit to a comprehensive national plan that provides more affordable and social housing, expands prevention and early intervention services, rapidly rehouses people who are homeless, and better supports those needing help to sustain housing. “This should include strategies aimed at identifying risk factors and population groups including women and children escaping domestic and family abuse, Indigenous communities, young people leaving care, and older people in the private rental market. The organisations have also launched a petition as part of the Vote Home campaign supported by the wider sector to generate public support for the campaign during the Federal Election.